MADRIX offers numerous effects to create a stunning light show. MAS Script is an addition to that. It allows you to program your own effects. The MADRIX Scripting language is an advanced topic, but allows you to realize very unique and customized effects. The Script Help [user manual] is for all those who want to develop light effects with MADRIX Script. However, this does not require much knowledge of programming. The different parts of this language will be explained with various examples. We recommend for your first steps into this area to work through these examples. In a second step you might want to try to alter the settings of those examples. In this way you will get a feeling for the programming language and the syntax. Load - Allows you to open a previously saved script from an external file [of the file type *.mas or *.macs]. 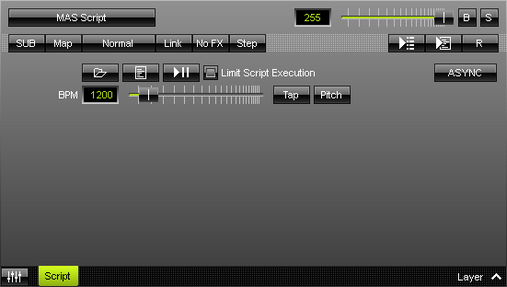 MAS Effect Script Editor - Opens the Script Editor to edit any MAS Script. Play/Pause - Starts or pauses the execution of a script. Limit Script Execution - Can be a helpful option if you run a script with a very long execution time. MADRIX will stop the execution of a script and runs it from the beginning if it takes up too much processing time or is stuck in a loop. This option ensures the stability and performance of MADRIX. Asynchronous Rendering - Allows you to choose the Synchronization Mode. - Activate ASYNC to control the render frequency using BPM. - Deactivate ASYNC to synchronize the render frequency with the Main Mixer [50 FPS by default].